"I would like to say thank you for the brilliant design of your stirrups. I am 16 years old and have suffered from chronic knee pain since I was 14. At one point, it was so bad that I was looking at taking time off of riding to recover, because when I did ride, I had to ride without stirrups and I couldn't compete without them. This was unfortunately right before the 2004 USEF Junior Dressage Team Championships (recognized by the USOC as a Junior Olympic Equestrian Event) which I had qualified for. My trainer (Jennifer Hoffmann) recommended that I try your stirrups, and it made all the difference in the world!! I was finally able to ride virtually pain-free, and I was able to compete in the championships, where I won the team gold medal and finished third individually. Since then, I have put your stirrups on all of my saddles, and I won't ride in anything else. Your stirrups saved my riding career! " 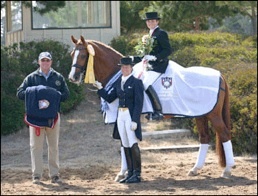 Olympic Dressage Rider overcomes pain of broken leg and 10 surgical pins using MDC Stirrups ! "This is why I LOVE my MDC Stirrups! Broke my leg in 9 places! The stirrups are such a help. Thank you so much." MDC Stirrups provide the three Cs for Eve Alexander: Communication, Comfort, Confidence. "...I would love to have the MDC Intelligent Stirrups on my trail saddle for comfort and security, and on my dressage saddle for improved leg position and effective communication. There is no other piece of tack or training device that has the power to do what these stirrups do! These stirrups accomplish what I call the three C's - communication, comfort, confidence." To read Eve Alxexander's complete winning essay submission click HERE. Anterior Compartment Syndrome in both of my calfs - MDC Stirrups "eliminated my constant pain and discomfort". "I'm interested in your stirrups. I have anterior compartment syndrome in both my calves, and as a result riding has become difficult for me - especially because I show jumpers. I bought the normal flexi stirrups and this made riding almost impossible due to the pain. I've been riding in a pair of stirrups with the eye placed more to one side (off set eye stirrups?) but those are only marginally better. The only stirrups that were sort of comfortable were ones with a wide base - but my coach feels that light weight stirrups aren't very safe in the jumpers because of the trouble retrieving them if you loose a stirrup. Do you think the MDC stirrups would be helpful in eliminating my leg pain? Which model would you recommend and why? Also do you find that they aid in creating a correct, solid lower leg position and heels that go down farther?" "Thanks for your concern. I bought a pair and just put vet wrap on them to try (the store wouldn't let me try a pair).! I will not be returning the flexi MDC stirrups - its wonderful to finally be able to ride without constant pain and discomfort!! Everything I read about them on your website and on the internet forums was correct - these stirrups actually DO eliminate leg pain and discomfort. I also wanted to thank you for your quick reply to my email and the follow up. It is wonderful to deal with a company who is willing to help the customer and who ACTUALLY stands behind their product. I will recommend your product to my friends, coach etc. I think if the Canadian companies who sell MDC Stirrups offered trial rides in a pair that sales would increase. The stirrups are much more expensive then regular fillis irons and often people do not want to spend money if the product does not deliver what it says it will." The MDC Corporation can find no greater reward than that of our customers satisfaction. We do stand behind our products and take great pride in providing our customers with exceptional products and professional service. "I just wanted you to know how fabulous your irons are. I carried them in my store for about 4 months, and all my customers were raving about them. The #1 comment was the amount of pain they relieved, I thought yea sure what ever. Then I tried them, wow were they right. I usually have alot of pain in my right hip but no more, who would think that a stirrup could do that. I went for a 3 hr trail ride and felt fine afterward, I was amazed, and normally I am screaming after 1 hr. I will never ride in anything else, thank you so much!" Cheryl had recently undergone laparascopic knee surgery for an injury and ongoing pain. She had continued to experience significant knee pain even after the surgery. MDC relieves pain and riding is "enjoyable again." "Weeks ago I was unable to ride without knee pain but since using the MDC Intelligent stirrups riding is not only possible but enjoyable again and most of all I am able to ride constructively as proven with Blackwood’s score in the Inter II on the weekend. Adding to this, the week before last I went skiing for a week. With my knee problem I was able to ski for the first three days but was unable to move off my bed on the 4th day. However, when I returned home I was able ride quite comfortably on the Sunday. I believe this is the result of the Intelligent Stirrup!" NO MORE PAIN AFTER 2 HIP REPLACEMENTS! "Just wanted to let you know how much I love these stirrups! Having two artificial hips, a bad back and an ankle full of hardware, I can say that I am comfortably riding with these. Love, love, love!!!! Here's a pic of my boy and I on the trail! Thanks SO much! Feel free to use this testimonial and pic if you need to." MDC 'S' FLEX STIRRUPS SAVED MY RIDING CAREER! "I wanted to do a very very special thank you post for Martin Cohen. I contacted MDC after I broke my leg and ankle back in October to see what they recommended for me. They gave me Martins number and we ended up chatting for over an hour. He picked the 'S' Flex stirrup for me and honestly without that stirrup I wouldn't be able to ride or show right now. MDC 'S' Flex Stirrups saved my riding career. I am incredibly grateful to Martin. Thank You! " "I have just recently gone through a major knee surgery. During the first week of December I tore my ACL and my Medial Meniscus while l was running in gym class. I was on crutches for six weeks and then started the road to recovery. I am fourteen weeks post surgery and I have been given the “all clear” to go ahead and start riding. I have been riding and showing in the higher level horse shows for the past five years. Last year I competed at Devon and Pony Finals in the pony jumpers. This year my goal is to compete at Devon again in 2016. When I was given the ok to ride I was using just normal stirrup irons and I couldn’t use them because it hurt my knee. My trainer Jayme Nelson from Pine Ridge Equestrian Center encouraged me to try the MDC Stirrups. I thought "they won’t make a difference so why should I bother?" The next day I put them on my saddle and gave them a try. They have made the biggest difference to me and my riding ability. I tried both the ‘S’ Classic model and the ‘S’ Flex model. The Flex stirrups give my knee the flexibility and stableness I need. Within just a few weeks I am able to jump my 13.1 hand pony over 3’9 fences. The give in the flex stirrups really helps me keep my balance and put the weight in my heels that is necessary. I would recommend the MDC ‘S’ Flex stirrups to anyone with knee problems. They have made such a difference in my life." "I wanted to wait until pictures from the last endurance ride were out but I wanted to share now! smileaway got to go out today. :) These stirrups made me sit properly which made him a completely different horse! He is fully retired but we had to get out! I have been riding in MDC Stirrups and they've been life changing! They aren't just for English riders either, they're for everyone- endurance, trail and western too! They have taken all of my pain and spasms away from my scoliosis and spinalfusion while endurance riding and trailriding. Martin Cohen was such a pleasure to talk and work with. I highly recommend MDC Stirrups! Those with all types of pain should try them! " THESE STIRRUPS ARE TRULY A MIRACLE! "I just wanted to touch base with you and say that the stirrups I received are miracle stirrups!!! My knee doesn't hurt when I ride & my feet are no longer going numb!!! Thank you for all of your help, my knee says THANK YOU!" "Many thanks for the articles, I found them very interesting! After previously reading about your stirrups and trying my friends for a couple of weeks, I noticeably saw a difference! No more back pain......which Ive always suffered with especially after canter or jumping work and no knee aches or pains either. I also had a riding lesson in them and my instructor said there was definitely a noticeable difference with the way I sat to the canter. When I reluctantly had to give the stirrups back to my friend I immediately noticed ankle and knee pain within 5 mins of being back in my old irons, so buying a pair of your stirrups was a must for me! I look forward to receiving them and hopefully continuing with my new and improved way of riding! " "The stirrups arrived in time for my lesson today. My instructor (of several years) was dumfounded to see my lower leg showing stability for the first time ever. She said, 'Diana, if there were one thing I could change about you, it would be to make that lower leg stable.' Well, now we have it. With a stable base of support, my horse was a dream to ride, uphill and in self-carriage. I don't understand enough of the biomechanics to explain it all, but I do know what works, and the MDC stirrups are worth every penny." "I recently purchased a pair of the MDC stirrups and had to tell you that I truly love them. I had a serious riding accident seven years ago and have ridden with knee pain since that time. Now I have no pain, no more stiffness when I dismount, even after hours in the saddle. I can't tell you enough how super these stirrups are, and thank you for the fantastic product!" "I have struggled for years with pain on my shins from riding—and I have the scars to prove it! No saddle or stirrup leathers ever fixed the problem. I tried your MDC stirrups and VOILA! Problem solved! I now ride pain free and no more sores on my shins! And not only no more pain, but my leg position is better than ever!" "I’m extremely pleased with the quality and functionality of my MDC Ultimate Stirrups. I noticed the difference immediately and am happier, more comfortable and feel my aids are more effective. They are an excellent quality product and a much needed innovation. The quality and function of the MDC stirrup irons definitely help me be a more correct and relaxed rider for my wonderful stallion. A fabulous product that I highly recommend to any serious rider." "I LOVE THESE STIRRUPS!!! Chronic knee and back pain have plagued my riding (which is also my career) - but not anymore! The shock absorbing nature saves impact on my knees and back - which has allowed me to ride more horses in a day. I also love the dial on top, the 90 degree is perfect for starting youngsters, no more searching for your stirrup. I also love the sleek black design. Thank you for creating such a great stirrup!!" "I was very hesitant to spend 200.00 dollars for a pair of stirrups, but was very curious about the design. So after much thought, and getting tired of fighting with my standard stirrups, I broke down and bought a pair. Man, now I wish I had bought them long before. They are great!! I ride dressage and have an educated seat and now my stirrups actually feel like a part of my feet. Best investment yet!" "There is absolutely no greater stirrup than the MDC and especially so for someone like myself that returned to riding after such a long time! The very instant that I put my foot in the 90 degree angled stirrup it was with ease that I was able to get my heel down and in turn, my calf right where it should be, on Valentino's sides! Moreover, it was easier to continue to keep my calf relaxed and stretched plus, when losing a stirrup, it was a breeze to find that my foot found its "rightful" place almost immediately!" "I just wanted to let you know that I received the stirrups-many, many thanks- and that I have ridden in and LOVE them! Even after just two rides, I have none of the discomfort in my "bad" knee that I ALWAYS have! I'm a convert and plan to tell ALL my club members about the product, which, by the way, I think you should rename; The TRULY Intelligent Stirrups!" "You may remember me - I'm the individual with who suffered a shattered pelvis and back in Colorado. I received your stirrups last week. Since then, I have ridden twice and they make such a difference! They really feel stable on my wobbly legs, my hips don't hurt and I'm able to post with much less trouble then before. They provide a very secure feeling. I really like them and as soon as I can get back into my dressage saddle I will order another pair. Thanks so much for your help and guidance. You have a great product!" "After a couple weeks riding using the MDC Intelligent Stirrups, I can definitely say they make a considerable difference lessening the strain on my arthritic knees. Less pain means I can ride longer and stronger. Thanks for a great innovation." "I have been a chiropractor for seventeen years and riding since I was ten years old and to say that my first ride (only at the walk) in your MDC Ultimate Stirrups was the best neuromuscular adjustment I have had is no exaggeration. My first impression and what I relate to others, is that riding in the MDC Stirrups is like riding without stirrups, allowing a deep soft symmetrical seat with full contact of my thigh and leg. The freedom of the entire limb from the hip joint through the toes truly allows an independent seat, regardless of the stirrup length. The feedback that i received from my patients that are using the MDC stirrup is outstanding especially from those who have had chronic knee, hip and lower back problems. Reports that patieints are able to ride for three to four hours without pain and with much less stress and fatigue throughout their entire body is quite a testimony to the biomechanical efficency that the stirrups allow. From the horse’s perspective, if we have less stress and strain going into our mechanics, then it seems an apparent observation that the horse’s back would experience less stress and pressure in the area of the stirrup bars. Not to go unsaid that if our weight and aids are more fluid and correct, the horse will benefit directly and immediately. The added safety of being able to retrieve a stirrup is great, although I have personally appreciated the ease of foot placement when mounting (no hands) and getting my leg out in front of me while being bucked about. I absolutely recommend everyone should ride in a pair of MDC Intelligent Stirrups for the improved ease in mechanics, improved safety and the sheer joy of it. "The design is very clever, and very practical. The model I tested (MDC Ultimate Stirrup®) will probably be the #1 English stirrup that I recommend from now on, because it combines the best features of both the types of stirrups I generally recommend. With the MDC stirrups®, the eye is not offset in a fixed position - these stirrups give you a choice of THREE different positions. That is, you can adjust them to hang flat against the horse's sides (traditional position), or to hang at a 90-degree angle, perpendicular to the horse's sides (as the Icelandic stirrups do), OR to hang at a 45-degree angle - halfway between those two positions. This solves several problems at once. You can pick up these stirrups easily, without twisting or torquing your ankles or knees, and without having to make two or three tries before your foot "finds" the stirrup. The 90-degree and 45-degree angle options make life better for riders whose natural conformation causes them to "toe out" a little - and those options also allow stirrups to be set individually (one at 45 degrees, one at 90 degrees) for riders like yourself who have one foot that "toes out" much more than the other. Some riders are made uncomfortable by the pressure that the leathers themselves can bring to bear against their boots or shins, and this, too, is addressed by these "Intelligent" stirrups. If you set them at the 45-degree angle, you will feel only half of the usual pressure from the stirrup leathers; if you set them at the 90-degree angle, you will feel NO pressure at all from the stirrup leathers. This may seem like a small and unimportant change, but ANY incremental increase in your comfort can have a big effect on your enjoyment of your ride. Before you buy a pair, you should probably visit the company's web site and look at the different models, sizes, and colours (they come in black as well as traditional stainless steel). You should be aware that - aside from the colour issue - there are two different functional versions of these stirrups. The MDC Comfort Stirrup® is the basic model with the three different adjustments. The MDC Ultimate Stirrup® offers the same three adjustments AND the flexing feature. This is the model I've tested, and I can tell you that it's a wonderful combination of form and function, providing riders with enhanced safety, shock absorption, customized comfort, and convenience. Yes, you could say that these stirrups are pricey, but I don't think you'll regret your purchase for a single moment." " I am writing to tell you how wonderful your MDC Intelligent Stirrups® are. Three years ago, my ankle was shattered when my horse spooked on the last fence of a triple fence combination and slammed my ankle into a jump standard. 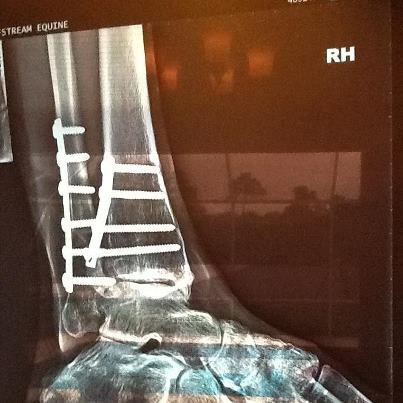 I had 9 pins and a plate holding my ankle together and were placed there to mend it back together. A year later I had another surgery to remove all the hardware except for one pin. After six months of crutches, and over a year of pain, numbness, numerous trips to physical therapy, the chiropractor, and the acupuncturist, my passion for riding horses did not diminish. Physically my ankle could not withstand a normal workout on my horse. I would have to stop riding and stretch my ankle every ten minutes or so. I tried your product at the Wine and Country Classic Horse Show in Santa Rosa, CA. The minute I put my bad foot into the stirrup, the usual tension could be felt in my ankle where the stirrup leather crosses over the front of my shin. My trainer, Tracey Martino, clicked the stirrup to the 90 degree angle position, and the tension disappeared! I thought, no way, this is too good to be true. I rode to the warm up arena thinking the usual pain and numbness to my ankle would return. Can you imagine how elated I was as I proceeded to work my horse for 45 minutes straight, without taking one break. I only stopped because I needed to catch my breath! I can't thank you enough for introducing this product and giving me the opportunity to try them out. Most of our barn purchased a pair of the"wonder stirrups" for themselves. I am also proud to say that I won my equitation over fences class in your stirrups the very next day!" " Recently I had the opportunity to try the MDC Comfort Stirrups. I can be quite a skeptic, especially when I have something I truly like and have used for over 25 years. Wow! I fell in love with these stirrups as soon as I put my foot into the stirrup to get on my first horse of the day. As I rode my horse I noticed I was not fighting with my stirrup, which I did not know I was doing until I wasn¹t. With this came a perfect (if there is such a thing) placement of my leg. My leg was wrapped around the side of my horse supporting him as he moved. Then miracle of miracles, his back started coming up under me. He finally had the balance, rhythm, straightness and forwardness I have been after for what seems forever. And, he was able to keep it for more than a moment here and there. I repeat, Wow! The next thing I noticed, I was sitting so lightly with my leg in perfect alignment. No wonder my horse was able to move so well. Who would think a pair of stirrups would be so powerful. The thing that makes these stirrups work is the top piece where the leather runs through, rotates to different angles. You can have a 45 degree angle set, many hunter jumper riders will be very comfortable at this option. I grew up fox hunting, riding lots of young horses and across country in addition to showing. The 90 degree angle option works for me. I like having the tread across the ball of my foot for the extra support and comfort. Speaking of comfort the wider tread is fantastic. When I took my horse for a gallop across the field, my leg did not move an iota. And he stayed quiet and round. I realize this sounds too good to be true, and that I am some amateur who really does not ride that well to start off with. O.K. I can accept that. The same things happened on my second horse. Also, I think I ride quite well, personally, but it is even better sounding if I didn¹t. Oh yeah, the marketing for these stirrups is if you drop a stirrup on course it stays in place so you can easily retrieve it. This is a great feature. The things I bring up are just as important, if not more so. Anything that promotes a rider to ride the best they can is very important to explore completely." "I LOVE my MDCUltimate® stirrups, and wish I'd bought them long ago. They are well worth the investment. I actually had to shorten my leathers by two holes with them set at 90 degrees for dressage, yet my legs feel longer and I no longer have a problem keeping my heels down. I'm better balanced and my horse moves better. I have a friend who wanted to try them out. She'd only made it half-way around around the arena, AT A WALK, and had already decided she HAD to have a pair. Thanks for inventing such a wonderful product! I'm telling all my riding friends about them!" "Just wanted to tell you that I LOVE MY NEW STIRRUPS!!!! Rode in them the first day and really couldn't believe my reaction -- they lie so evenly under your feet. For the first time in my riding career I feel as if I actually can have my leg in the proper position AND have my weight evenly distributed on the ball of my foot. The next day I told my trainer "I think I love these stirrups. You have to try them." She did, and said the same thing. Today we both tried them again and said: "We DO LOVE THESE STIRRUPS." Thank you for a fabulous iron!" " I purchased my stirrups from State Line Tack. I used them for the first time yesterday and I really liked them. I'm 58 years old, starting riding only 8 years ago, and being not so limber anymore, retrieving my stirrups while riding is very important to me. Also, my joints don't flex like a teenager. So the way the stirrups bend is very comfortable." "The stirrups arrived in time for my riding lesson this week, ealier tonight, in fact. They work great and are extremely comfortable. I just wanted to tell you how much I like them." "Thank you for the stirrups. I have used them daily since I received them, both in regular work and competition. I really like the Flex Stirrups and if possible could you please send me another pair of them." "I went XC 2star today on my young horse using your stirrups. They are bloody brilliant! - Perhaps a number of reasons why had such a good ride, but I am certain they assisted greatly! Lower leg position was better, balance was better and less strain on my lower back and pelvis. Excellent." "I have had two riding lessons since I received my gorgeous stirrups, and I have received far less criticism about my seat position!! That is TERRIFIC! When I unwrapped them to transfer them to my saddle leathers, everybody gathered around to see how they worked and to read the brochure that came with them. People were amazed that the stirrups offered BOTH the swivel and the safety feature. All in all, I can assure you, a HIGH POSITIVE. I really love them and actually - they truly help."